HAWK PEN Artist Edition: Limited edition designed by top Cheyenne artists. The Cheyenne HAWK PEN stands out through its unique shape: This pen-like form features an exceptionally ergonomic design that guarantees complete freedom of movement. And there’s more: We have immortalized top tattoo artists from around the world in this limited edition of our HAWK PEN. Each artist submitted a design that was then engraved on the HAWK PEN. This is how the Cheyenne HAWK PEN Artist Edition emerged – a unique creation bound to become a collectors’ item. No limits- be a tattoo artist! 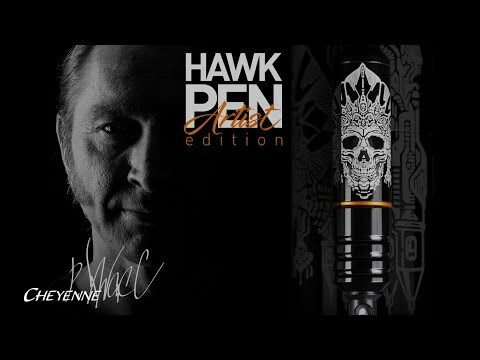 The revolutionary, ergonomic Cheyenne HAWK PEN shines in new splendor: We asked a select group of our top tattoo artists to submit a design for the HAWK PEN Artist Edition that reflects their personal style. Each design is engraved into the HAWK PEN using an intricate laser technique. The engraving on the machine is covered with a lacquer seal to make sure that the HAWK PEN can still be used hygienically. This special edition is distinguished by its unique design, individuality, style, and exclusivity. Biomech and bold colors. A renowned US artist whose work is highly recognizable. An absolute legend in the business, known around the world for his extraordinary black-and-gray work. Classic Japanese tattoo art, creatively interpreted and flawlessly executed details. Portraits and realism in color. Perfection without compromise. Textures and details with incredible depth, displays realism that deceives the eye. Horror in multicolor hues, richly worked into the skin. An icon of this genre. All these artists have contributed to a one-of-a-kind creation bound to become a collectors’ item. A limited edition for you – by your tattoo icon. High-end design "Manufactured in Berlin". I've been using Cheyenne for so long now it's what I'm most comfortable with and being able to use multiple needle configuration with the same machine makes it super convenient. I believe I was the first American artist to start using Cheyenne machines. I love all Cheyenne machines. It is very simple to me, that it works! I start working with Cheyenne when their first machine, the HAWK hit the market. I tattooed with a Mickey Sharp’s “Hornet” coil machine at the very beginning, then through my mentor Boris and my friend Konrad Lackner, I got to know Cheyenne. As for now, I favorite machine to work with is the new SOL Nova. Cheyenne always convinces me with their silence and precision.